Chill filtration: is it bad for whisky? Single malt fanatics are conditioned to believe that anything labelled ‘non-chill-filtered’ is inherently superior; that the whisky is somehow more intact and authentic. But what is chill filtration anyway? And is it such a bad thing? Here’s the Whisky Professor’s take on the subject. First of all, many thanks for your answer on Sherry casks – certainly cleared the air for me. On the subject of being clear – and I know this is an old chestnut – chill filtration. A controversial subject, and I realise much written and many opinions expressed on it, but it would be kind if you would explain the realities of this in your own inimitable style. I am also aware of various temperatures used for various results, but my big conundrum is the 46% abv story, where clouding supposedly does not take place with water. In many cases, I have seen the 'golden amber' go cloudy at 46% and above. Out here with humidity levels and air conditioning, the whiskies can go cloudy just sitting in the glass neat, with no water added. I’m off for a wee sensation and look forward to your response. You really are too kind, and thank you for your question. I have to say that I was expecting this thorny topic to crop up at some point. While I’m not entirely sure just how much clarity (pun intended) I can offer on the subject, I can at least attempt to set chill filtration in its broader context. First of all, the process itself. It occurs before bottling and consists, as the name suggests, of chilling the whisky down to a low temperature (often around 0C, sometimes even lower), then – before it has the chance to warm up again – passing the liquid through a filter to pick up tiny particles. Why do this in the first place? Well, if you bottle your whisky at less than 46% abv – and the vast majority of Scotch falls into this category – then it will typically form a ‘haze’ at low temperatures, or following the addition of water or ice. While this poses no health hazard or has any noticeable impact on flavour, it may be off-putting to the poor punter who has just stumped up some of his hard-earned to a local bartender. Or indeed to the distributor in the frozen north who unpacks his crate of Scotch to find a faintly cloudy liquid lurking inside the bottle. The punter might send his drink back, or be put off Scotch for life. The distributor might switch to selling a different product. Nobody, clearly, wants that – least of all the owners of the biggest-selling blended Scotch brands. Chill filtration is a means of preventing this – in effect, it recreates the potentially unfortunate ‘haze’ moment, then strips that haze out and prevents it from re-forming. What is this haze? Good question (but then I find the rhetorical ones usually are). We need to talk about flocculation here or, as its friends know it, ‘floc’. Whisky can suffer from two types of floc: reversible floc, and irreversible floc. Reversible floc is what we’re mainly concerned about here, because this is the haze that forms at low temperatures and with the addition of water. Give the whisky a warm and a swirl, and – hey presto – it’s gone again. What you’re seeing are ethyl esters of long-chain fatty acids, and larger alkyl esters – formed during the making of the whisky and linked to factors such as the cut points employed at the distillery in question. Some extracts from cask maturation can also contribute to reversible floc. But there’s also irreversible floc, which takes the form of very small crystals of calcium oxalate. This can be derived from the water used to reduce the spirit prior to bottling – this should be demineralised as high levels of calcium or magnesium can promote the formation of floc. And, somewhat ironically, it can also be promoted by the filtration process itself. If you don’t acid-wash your filter sheets prior to use, calcium can leach from the sheets – and there’s that floc again. There is another solution that removes the need to chill filter your whisky in the first place: raise the strength to about 46% abv. This should prevent any haze from forming at full strength; but once you start adding water (or ice), you’re lowering the strength, and our old friend floc is back in town (which may help to answer your supplementary question). That’s what can happen, and why. At this point I get a little uncomfortable as an objective man of science, because we’re about to enter the world of subjectivity and opinion. Chill filtration gives a clear, bright whisky – but what if it also takes something away? 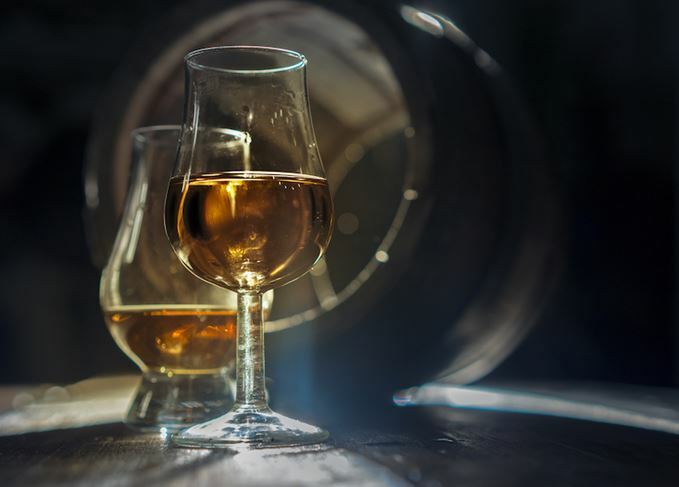 In recent years, there has been a growing groundswell of opinion that this is the case, that chill filtered whiskies have been robbed of some of their flavour, texture and mouthfeel. You may be familiar with the story of Burn Stewart’s former master blender, Ian MacMillan, who persuaded the company in 2010 to raise the strength of all its single malts – that’s Bunnahabhain, Deanston, Tobermory and Ledaig – to 46.3% abv, while also discontinuing the practice of chill filtration. MacMillan’s description of the ‘oily and greasy’ substance, rich in aroma and texture, that was previously left on the filter plates, is persuasive stuff – but then he also admits that the effects of the switch may have been more pronounced with the Burn Stewart malts than with others. Bruichladdich and Arran are passionate exponents of the MacMillan philosophy, but on the other hand, some blind tasting studies suggest little impact on flavour – even for expert tasters – from the process. It is certainly true that the ‘non-chill-filtered’ epithet has become a rather useful marketing tactic, whatever the impact on spirit quality. The debate will run and run. As for me, I will take refuge in science and politely point out that chill filtration need not be a black-and-white, either-or decision for distillers. It is perfectly possible to tweak or adjust the process, simply by not chilling the whisky quite so fiercely. Do this and less material will be forced out of solution by the cooling, meaning that less will, in turn, be removed during filtration. A happy medium? The truth is often more complex than might be suggested by attractive, if rather simplistic, solutions. But in a world where it seems certainty is increasingly valued above rigour, I’m quite happy with that. What do the words ‘limited edition’ and ‘Master’s Select’ on a whisky label really mean? The master blender and distiller will leave the Lowlands distillery he helped resurrect. The traditional distiller on gin, terroir and why whisky with milk is a winning combination. Burn Stewart master blender Ian Macmillan has joined Bladnoch as master distiller. Malt aficionados rail against chill filtration of Scotch whisky. So why is it still so commonplace?